Are the leaves changing color where you live? I must admit…I miss getting to experience those first exciting hints of fall like we did in Colorado and New Mexico. Friends are posting pictures of the Aspen Trees on the mountain in Santa Fe. 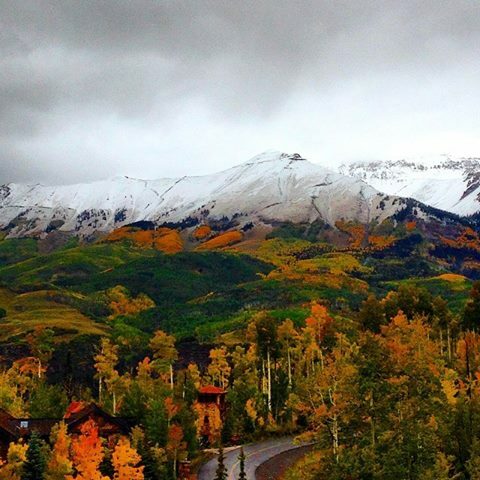 And Colorado is showing off with amazing fall colors in contrast to snow-capped peaks. Newsflash – the palm trees don’t turn brilliant colors and shed their leaves in the winter. While it’s nice to throw on a tank top and flip flops to walk the boys down to school, I do miss the natural transition to jeans and boots. I have a feeling though, that come February, I will not miss fitting four kids into snow boots and winter gloves. I have long thought that the vibrant colors of fall are a creative gift from God. I bet He came up with that idea so we wouldn’t complain so much when the time comes to rake the leaves out of the yard. And along those same lines of God’s creativity, I think the clear reason that newborn babies are so scrumptious and have that amazingly unique smell is so new parents have the super human ability to wake up every three hours through the night for weeks on end. Douglas Quenqua wrote about a study published in the journal, Frontiers in Psychology, confirming that ‘new baby smell’ acts as a kind of sensory rush for mothers. According to the study, researchers asked 30 women — 15 who had recently given birth, and 15 who had never given birth — to identify mystery scents while their brain activity was monitored. When given the smell of newborns, the women all showed activity in the same dopamine pathways that light up after ingesting stimulant drugs and enjoying good food. God is a genius! It’s as if He has it all figured out. It’s a miracle in the first place that babies are formed in the womb and bless our families the way they do. But it’s a routine miracle that these little miraculous lives enchant their parents day after day, night after night – even in the midst of serious deep sleep deprivation. Routine miracles are events that happen regularly – every day…every year…often enough to see a pattern – yet you are still absolutely blown away each time. I won’t see very many changing leaves in SoCal this fall. But every time I see the sun set over the ocean (apparently it happens EVERY DAY here), I am in complete and utter respect for the beauty of life. And for our magnificent Creator. In the midst of my mundane routine (like sorting up to 84 socks per week! ), God gifts me with little reminders of His everlasting love for me. And no matter how much I screw up, how much I loose my patience with my kids, how much I fail to show my best friend how much I love him — the leaves still turn, the sun still sets, my growing babies still enchant me. And I am reminded that “God is the same yesterday, today, and forever” (Hebrews 13:8). And He loves me yesterday, today, and forever. My Jesus Calling devotional on October 8th reminded me that every day I must look beyond the mundane, chaotic, and often sad circumstances of life and discover God gazing lovingly back at me. What are the routine miracles in your life this week? It is my prayer that we all recognize and appreciate the routine miracles and feel the deep love that God has to offer through those events. So grab a pumpkin latte (or maybe a pumpkin ale if its warm) and soak up the gifts of fall.